Every Tuesday, a friendly group of knitters gathers at Jacob Edwards Library from 10:30 a.m. to 12:30 a.m. The group, called Knitting with Sonya on library calendars, is a group of knitters, crocheters and other crafters that is open to anyone. Despite the informal nature of the group, there is usually a large circle of knitters and crocheters in the reading room of the library Tuesday mornings. For the last several weeks, members of the group have been working on a special project which is an initiative of the American Heart Association. “Little Hats, Big Hearts” will bring a red knitted hat to every baby born in February in participating hospitals. The hat will accompany an informational flyer given to new mothers that provides education on the warning signs of congenital heart disease in newborns or heart disease in parents. Each red hat is knitted by local knitting and craft groups like the one that gathers weekly in Southbridge. The hats knitted by the Southbridge group will go to a hospital in Hyannis. 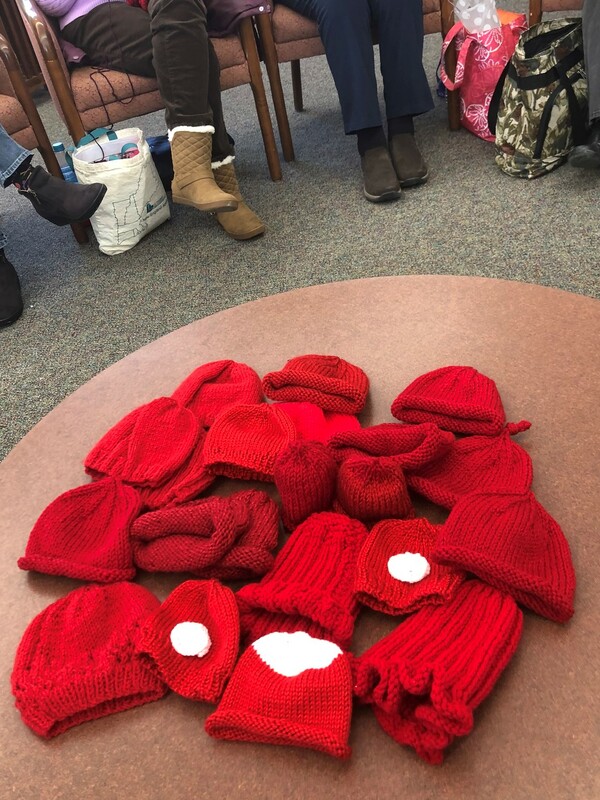 Two members of the Southbridge group hand-delivered the knit caps before January 31 to Cape Cod, so that the first baby born in February can get one of the lovingly made hats. Donna Craven, of the Southbridge knitters’ group, is coordinating the effort this year. As of the time of our interview, she reports that the group had knitted almost 50 infant hats in various sizes. Some of the knitters included special touches, like a pink heart on the red hat. Last year, the same group donated hats to Hartford Hospital as part of the American Heart Association’s Little Hats Big Hearts campaign. Craven says that each year, more hospitals join in the campaign. For more information about this initiative, visit The American Heart Association’s website.